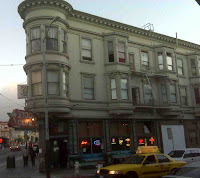 The 3300 Club is on the corner of Mission Street and 29th. The building is old and has a lot of character which is highlighted by the large red 3300 Club marquis jutting out over the corner in front of the entrance. 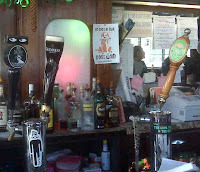 From the moment I walked in I could tell that I was in an Irish Pub and I was ecstatic to see draft beers—which I haven’t seen since my first Mission on Mission stop, St. Mary’s Pub. As I contemplated delicious options such as Big Daddy, Sierra Nevada, Widmer Hefeweizen, Guinness and Stella Artois, I took in my surroundings punctuated by an eclectic collection of art, signage and a James Brown bobble head. Though tempted by local brew, Big Daddy; I opted for a nice light and refreshing Belgium option instead—Stella it was. The glasses were cold, the beer was delicious and the company was a mix of Hispanics, Whites and even some women. The pub was busy so I sat in one of the last stools available at the bar between a woman in her 20s and an older gent. The place was relatively quiet, beside the low hum of conversation, until the woman to my right, who aside from me and the old man to my left seemed to be the only ones who were alone, got up and selected some music from the juke box. My ears rejoiced as I heard the Rolling Stones playing “Paint It Black”. I hadn’t heard anything besides Spanish Ranchero music until Friday’s Stones, Beatles and Hendrix kicked off the evening’s tunes. It was right about 7 when Bruce (white), slouched in the stool next to me, put down his paper and asked about the baseball game. Bruce is, as he describes himself, an 84 year old whose bottom half (of his body) doesn’t work (a lark scooter owner who used his cane on Friday night) but the top half is 20 years younger than his age. He was born and raised in Northern California and is a regular at the 3300 Club frequenting on and off for the past 40 years. He started telling me about some of the history of the place and the Mission neighborhood. It was strange to be in an Irish pub in the middle of the many Hispanic bars this early on my journey. According to Bruce, the neighborhood used to be heavily populated by Irish and Germans. Learning this was intriguing and speaking to Bruce I became more interested in the neighborhood’s history. I’m fairly new to San Francisco, 3 years, so learning this was fascinating. During the 19th and 20th century there was a large European settlement in San Francisco bringing a great number of Irish and German immigrant workers to the Mission District. This made a lot of sense thinking about all of the great Irish Pubs located throughout the city that have been around forever. In the 1940 – 1960s the Mission gave way to a large number of Mexicans moving to the area as the whites moved out. The Mexican community has since been joined by immigrants and refugees from Central and South America. Many coming to San Francisco leaving the civil wars that ravaged their countries during the 1980s and 1990s. By the looks of it, with the growing population of Hipsters around Mission Delores Park, we may soon see another cultural shift start to make its way to Mission Street. First we had the introduction of Irish freckles and Guinness, moving on to sombreros and tequila soon to become tight pants and Pabst Blue Ribbon. So if Bruce has been coming here the past 40 years how long have the rest of these people been pulling up a bar stool? Right about that time Julio introduced himself. Julio (Nicaraguan) and his wife (El Salvadorian) have been Missionites and 3300 Clubbers for almost 20 years. Julio, his wife and I downed a shot (Julio’s treat) as I told him about my background and family. As we talked Bruce and Julio would reference other regulars and their stories. I laughed because they weren’t only referencing these folks by their names and nationalities but also by the time they usually show up. I started to feel like I was a guest in someone’s house and wondered if I was in someone’s seat. It’s amazing how quickly two hours can fly by when you’re chatting it up with a cool group of people who have just welcomed you into their place. On my way out I thanked Owen, Irish bartender, said goodbye to Bruce (Julio and his wife left a few minutes earlier) and walked out into the windy San Francisco evening wondering how long I’d be living in the city and if I’ll ever call a bar my own like these guys do. Love the blog, and particularly your post about the '33 as it's been our family business for more than 50 years. 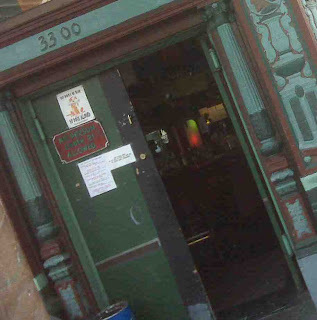 There's a bit of history of the building on our website (3300Club.com). Glad you enjoyed the visit, hope you'll be back when your bar tour is done!